This propane gas grill has two stainless steel tables for food preparation that can be folded up for easy maneuverability and savings in space if it is stored. This also makes it the choice for those with smaller patios, balconies, or decks. This Weber gas grill is loaded with excellent features, so read on and find out why this is our choice as the top overall BBQ grill for your home and portable usage. Is the Weber Gas Grill right for me? One of the best BBQ grill features with this unit are the two stainless steel burners with 26,500 BTU-per-hour of cooking power. This propane gas grill has 360 square inches of cooking space, and a 90 square inch space for keeping food you have already prepared warm until it is served. The Weber grill is made to be tough, as well as attractive to the eye. It also features porcelain-enameled, cast-iron cooking grates and a porcelain-enameled Flavorizer bar. This propane gas grill is easy to get started considering the convenience of the push of a button and the electronic crossover ignition system starts the unit. There is more than enough room to cook a large turkey, while at the same time roasting other meats and vegetables. This propane gas grill is easy to clean, and it retains heat as well as any grill you will find. The control panel is located on the front of the grill, and it has an easy to read fuel gauge that will let you know when it is ready for a fill up. This propane gas grill also has an enclosed cart, which may be used for storage. Other prominent features include two heavy-duty, front-locking casters, two heavy-duty back swivel casters, and six tool hooks to help keep you organized and keep all of your cooking tools clean. This Weber gas grill also has a grease management system. When cooking, the juice from the meats will drip down into the Flavorizer bars. What is not vaporized is funneled to the grease management system, which consists of an angled grease tray and a catch pan. Both are placed a safer distance from the burners to not be a fire hazard. Both are easy to clean as they can be removed and cleaned out in just a few seconds. The Flavorizer bars are also a special part of the Weber gas grill. They can catch droppings that smoke and sizzle, and can add flavor to your food. These bars are durable and long lasting, and can easily be kept clean by cleaning them off periodically with a stainless steel grill brush. While the vast majority of the BBQ grill reviews for this propane gas grill have been overwhelmingly positive, there have been a few that raise a bit of concern. This propane gas grill does not come assembled, though most people reported having no problem in putting it together. There were some buyers that did encounter problems in getting it into one piece ready for use. Other buyers have complained that it takes longer than average to heat up, and that leaks developed in the unit over time. If you are looking for a space-efficient propane gas grill with at least two burners, as well as a warmer, with ample amounts of table space, this is a good choice for you. The Flavorizer bars add to the taste of your food, and these were invented by Weber, and no one does it better. While some assembly is required, the gas line assembly and the firebox are pre-assembled, so all you have to do is assemble the cart and attach the components. You do not have to bother with matches, wood, or lighter fluid with this Weber gas grill, and the propane tank meter has a very accurate gauge that lets you know when it is time to refill. 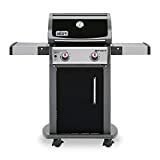 While there have been a few BBQ grill reviews for this product that expressed concerns, the vast majority of reviews have been from customers who are extremely satisfied with their purchase from Weber. The grills are made from solid iron to be durable and reliable, and the ignition system makes it easy to get your cookout started.